Calendula, also called Marigold, is a classic vulnerary herb used for inflamed and damaged skin. It is the archetypal remedy for various types of burns including sunburns, thermal burns and radiation burns, but research has shown some mixed results. As an antiulcerogenic herb it has been used to treat both internal and external ulcers, including venous leg ulcers & trophic ulcers. 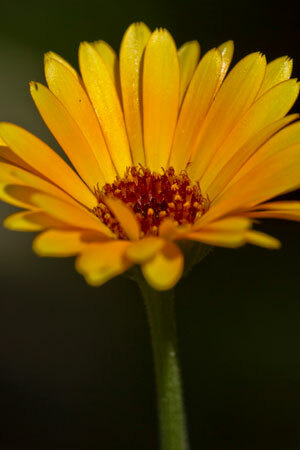 In addition to wound healing, calendula is often used to soothe dermatitis (i.e. inflamed skin) including eczema and contact dermatitis. Research shows it may also help with "diaper dermatitis" (i.e. diaper rash). Calendula is not used primarily as an antimicrobial herb but it does possess significant antibacterial, antiviral and antifungal effects.